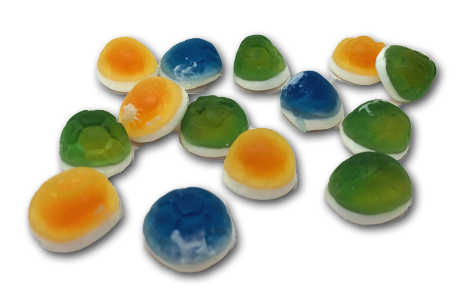 In timely World Cup fashion, these interesting looking gummies from Haribo arrived on the Suze express the other day: A Haribo candy made expressly for the 2014 World Cup? I took a look at the fruits on the bag, which Haribo usually includes to give you an idea of the flavors inside. Hmmm…. As you can see, some of the foamy/marshmallowy bottoms has melted on the the tops on lots of these. 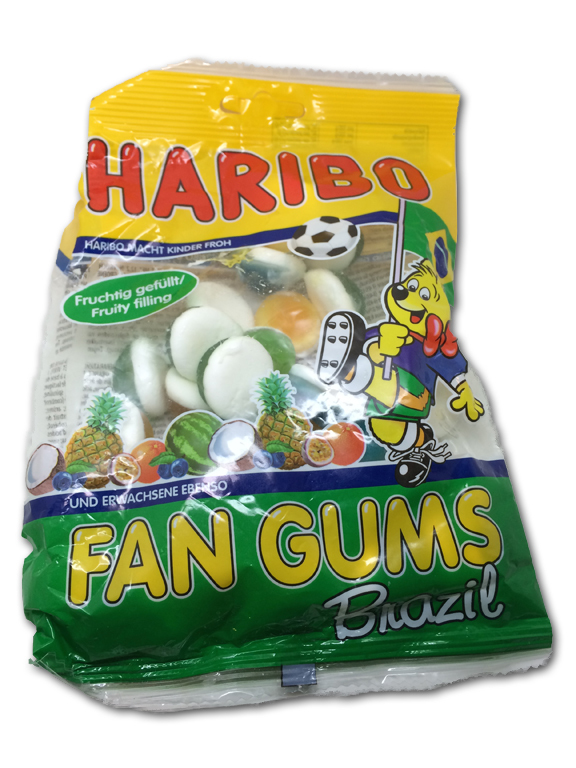 Kinda gross looking, and YES, they traveled across the world, but still…c’mon, Haribo. We know you can do better-I’ve never experienced this before, and ‘ve experienced a lot of Haribo shipped overseas. Honestly though, this doesn’t bother me so much, aside from the annoyance of getting super sticky fingers when handling them. What annoyed me-nay-terrified me, was the experience of eating them. Wow. Absolutely vile. I don’t know how Haribo managed to make such seemingly good flavors taste offensive, but between myself and the family Guru, no one liked any of them. In fact, Jonny Guru Jr. & Mrs. Guru spat all of theirs out. Not the most winning sign. To be a bit more fair, most of the flavors were too perfumy and sweet, but not disgusting”. Completely non descript and confusing though-it was impossible to pinpoint the flavor, even though I knew them! The blueberry coconut though? Wow. 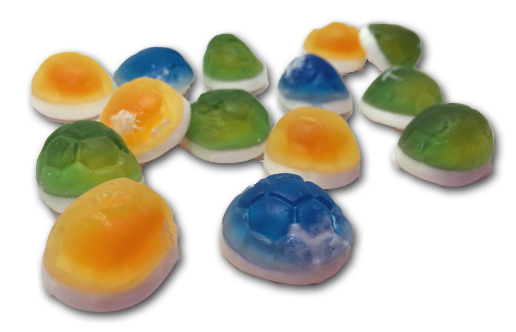 Never have I hated a coconut candy as much as this. It’s an island fun coconut vibe that’s suddenly overshadowed by…dull sweetness with a weird off additional tropical edge-it just culminated into tasting like a horrid cocktail. These are bad. Real bad. And while I give Kudos to Haribo for trying to make something timely, they screwed the pooch big time. How about Caipirinha, coconut, and lime as the three flavors? What they delivered was too much, too muddled, and way to gooey. So put back your Vuvuzela, and eat something else while watching this (I guess) wonderful footie tournament. And don’t hold this against Brazil-sure, they might not be known for their candy- at ALL- but I promise you, they can do better than this.